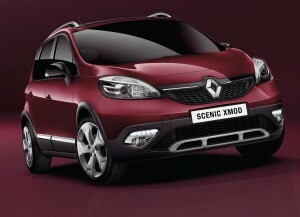 Renault’s new Scenic is, in fact, a crossover called the XMOD. I was a huge fan of the original Scenic – a breath of fresh air which opened a new market but with XMOD I’m not quite so sure. But now the crossover segment is growing quickly and all the manufactures are jumping on board. The Scenic XMOD follows on the heels of the recently announced Captur, and has a traction control system called Grip Xtend. This offers three settings, including ‘expert’ mode and also controls the braking system. Though I doubt whether many XMOD owners will actually put the system through its paces off-road or in severe weather conditions. There’s also a stop/start system to help save fuel and it has Renault’s new branding. The car still essentially looks like the Scenic with its MPV feel but the new styling really does take it in a new direction. They’ve also added three new engines to the line-up which are around 15% more efficient than the ones they replace. It has decent ground clearance and allow wheels, special bumpers, sill guards and chrome-finish roof bars and there’s LED daytime running lights too. Renault is also updating its Grand Scenic too along the same lines. The new Scenic XMOD and the Grand Scenic will be making their world debuts at the Geneva Motor Show in March. This entry was posted in Car Updates & Releases, Family Car, New Cars and tagged caption, car, Geneva Motor Show, GM, Grand Scenic, Grip Xtend, LED, LS, MoT, MPV, renault, XMOD by Steve Lumley. Bookmark the permalink.